Mike is the author of Focus on the Good Stuff, Be Yourself Everyone Else is Already Taken, and Nothing Changes Until You Do, which have been translated into 15 languages. His fourth book, Bring Your Whole Self to Work, was released May 1st. In his latest release, Mike sets his focus specifically on professional and organizational development. Bring Your Whole Self to Work: How Vulnerability Unlocks Creativity, Connection, and Performance, concentrates on the most important elements of his work: authenticity, vulnerability, appreciation, taking risks, and building strong relationships and teams. Mike draws from more than 17 years of researching, writing, and speaking about essential human experiences and high performance in the workplace. His clients have ranged from Google to Citibank, from the U.S. Department of Labor to the San Francisco Giants. From small start-ups in Silicon Valley to family-owned businesses in the Midwest. From what he’s seen and studied over the years, Mike believes that for us to thrive professionally, we must be willing to bring our whole selves to the work that we do. And for the groups, teams, and organizations that we’re a part of to truly succeed, it’s essential to create an environment where people feel safe enough to bring all of who they are to work as well. It's filled with stories, inspiration, perspective, and practical wisdom. Mike shares vulnerable truths, important insights, and a valuable knowledge that can transform your relationship with yourself, as well as your relationships with others and with life itself. Nothing Changes Until You Do debuted at #1 on the Marin Independent Journal's bestseller list when it came out. The book is filled with action items, ideas, and suggested exercises and practices. Mike offers five powerful principles of authenticity and then provides action plans, exercises, resources, and anecdotes that demonstrate how to apply these principles on a daily basis in life. Written for people who want to improve their lives, their work, and their relationships, the book is brimming with inspiration and practical help. Be Yourself, Everyone Else is Already Taken, reached #17 overall on the Amazon bestseller list and appeared on the Marin Independent Journal’s list of bestsellers. It also received a coveted “Starred Review” from Publisher’s Weekly. This book too is filled with action items, ideas, and suggested practices. It is easy to take what you learn in Focus on the Good Stuff and use it in your life right away. 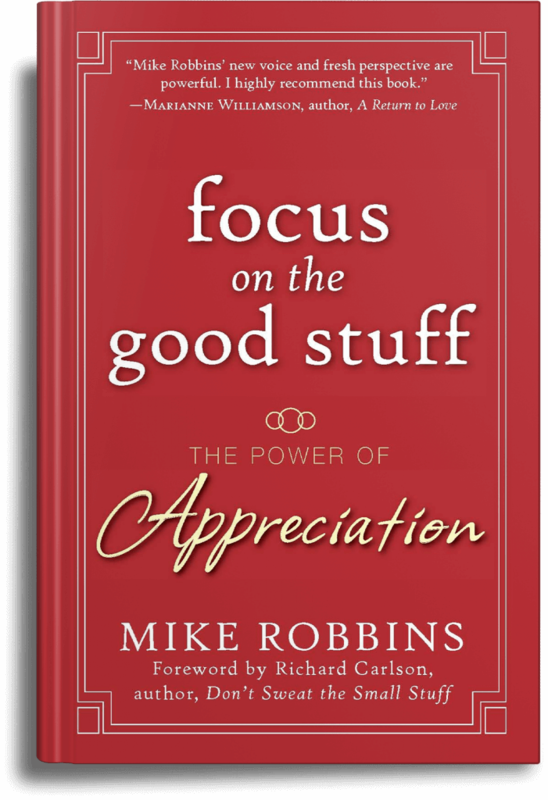 Mike shows us that it is our ability to feel and express true appreciation-to focus on the good stuff-that leads us to genuine fulfillment in our lives, not the other way around. The art of appreciating our lives goes way beyond simply saying “thank you” or occasionally noticing nice things. True appreciation is about altering the way we relate to ourselves, others, and the world around us. By living our lives in a grateful way, we put ourselves on a path of fulfillment, happiness, and success. Focus on the Good Stuff reached #4 on the Amazon bestseller list and also appeared on the San Francisco Chronicle’s list of bestselling books. In addition, it received the prestigious Silver Nautilus book award.